The Utah Stream Access Coalition is calling for support of Utah House Bill 37, which will allow increased access to public waters, and is leading a rally on February 11 at the Utah State Capitol Building. 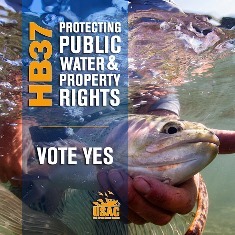 Utah Stream Access Coalition: Support HB37 – Protecting Public Water & Property Rights! In the state of Utah, it is against the law for the public to recreate (fish, wade, etc.) in public waters that are adjacent to private property. The law severely limits the freedom for not only the residents of Utah, but also to any persons who come to Utah to enjoy our precious streams and waterbeds. It’s the public’s right to lawfully access and use its public waters in place for any lawful activity, including recreation, allowing the public to reasonably touch privately-owned beds of public waters in ways incident and necessary to such use. This right is defined in Utah’s constitution, and has been upheld by the Utah Supreme Court several times. Non-Residents: Contact the office of Governor Gary Herbert, his chief legal counsel, and his senior environmental advisor. Tell them to support HB37! You can also help by donating to the cause. Fishermen, boaters, birdwatchers, hungers, and nature lovers; everyone and anyone who uses water for recreation in the state of Utah needs to voice their support in favor of river and stream access. Please join the Utah Stream Access Coalition (USAC) and their members at the State Capitol building for a rally in support of HB37! So bring a friend, neighbor, or a coworker: grab your paddles, kayaks, fishing nets, and SUPs, and let’s stand strong on the steps. When: Tuesday, February 11 at 9:45 a.m. This year’s rally is our most important yet. We need to show Utah’s elected public officials that the people support House Bill 37. We have the momentum. We have the support. Let’s make our presence known, with the biggest rally to date. Let’s end this issue this year for generations to come. We stand 3,300+ strong, and our voice will be heard! After the rally we will all enter into the capitol as grassroots lobbyists and talk to our elected officials. For more information visit Utah Stream Access Coalition.